I know. I know. Going to a Kilwins is something tourists do. I’ve been there, done that. So why in the heck did I take the family to Kilwins for ice cream instead of seeking out a local spot. Well, that’s easy. This Kilwins isn’t like the others. This Kilwins isn’t the small, downtown shop where you can watch candy being made in the window. 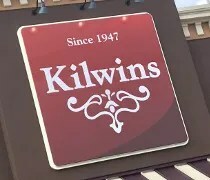 This Kilwins is the mothership. 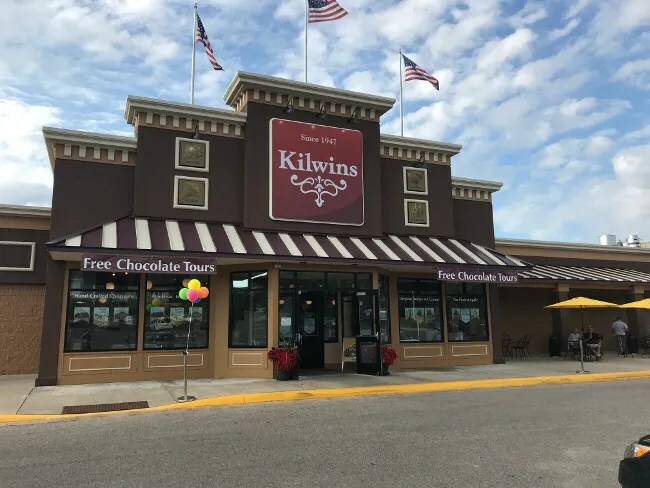 Kilwins Chocolate Kitchen is on Bay View Road just outside of the Petoskey city limits on the east side of town in the unincorporated resort community of Bay View. 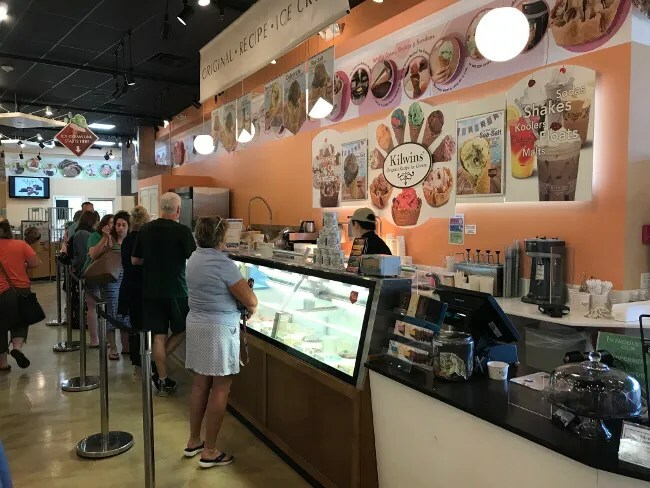 The store is a massive facility by Kilwins standards and looks more like a small grocery store from the outside than some cute, downtown shop. 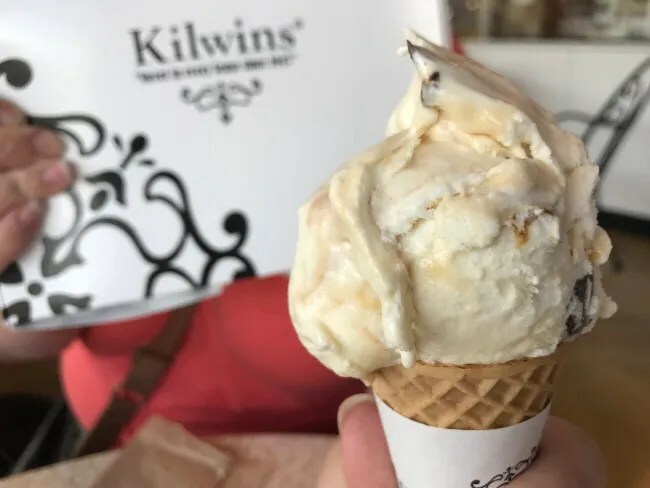 Kilwins got it’s start in Petoskey in the late 1940’s and they’ve been a part of the community ever since. This store is a production facility of sorts making the packaged chocolates you see in stores as well as quite a bit of the ice creams. The store is divided up into three pretty distinct sections. There is a space right inside the door where the fudge counter is. I couldn’t just keep walking. I love Mackinac Island Fudge. If I had to live on one sweet treat the rest of my life it would be slices of fudge. They had a deal of five slices for $30 but that’s more fudge than we needed. We did the typical buy two get one free which comes out to $20. 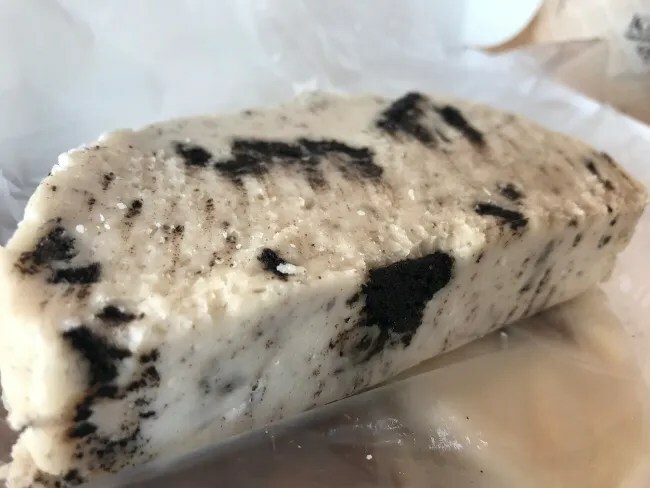 We got both a chocolate and vanilla sea salt caramel but it was the cookies and cream that I couldn’t wait to destroy. I love the vanilla fudge with pieces of cookies mixed in. 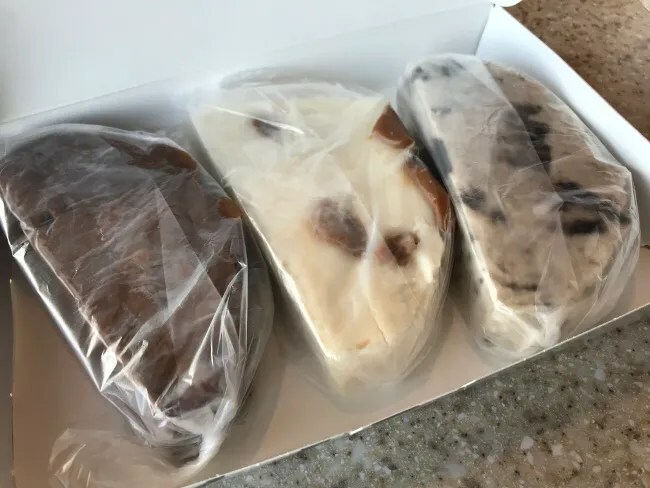 The kids all got ice cream and I just waited to get back to the cabin to eat my fudge without everyone asking for pieces. Along the backside of the retail area is the chocolate counter. All of their chocolate creations are in a glass case on display. If they can wrap it in chocolate, there’s a chance they do. Behind the chocolate counter is a peak in to the process. The store offers free chocolate tours but we missed the last one by about ten minutes. 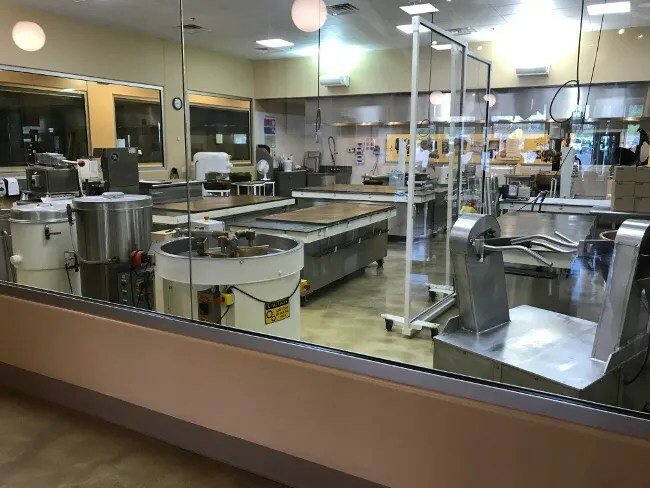 There was nothing being made while we were there, but you can see in to the big production kitchen where a lot of the candy that is shipped out to stores is put together. A lot of that candy is for sale in this store is well. The retail floor is probably larger than most Kilwins Chocolate Shops. There is just display after display of the delicious creations they come up with in the kitchens just behind the glass wall. We were actually there for ice cream so we headed over to the ice cream counter which had a pretty decent line for a Thursday night. 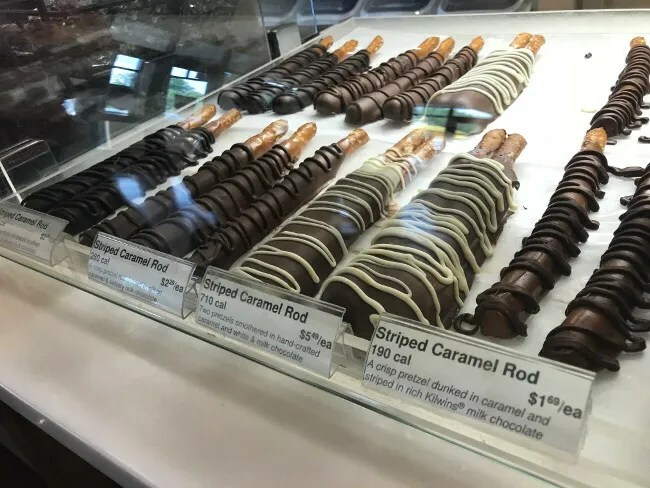 Kilwins Chocolate Kitchen is a destination stop. It’s not like the downtown locations where you just think, “hey, let’s get some ice cream.” The line was long but moved pretty quickly. J got each of the kids a dish. 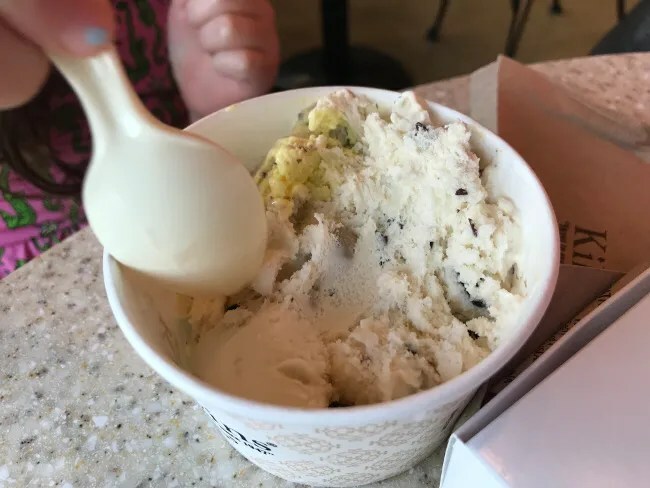 B just got one scoop because he never finishes what we get him. He wanted cookie dough which was fine by me since I was likely going to help him anyway. L was able to get two scoops but she picked her flavors before she noticed the Superman ice cream. She also got a scoop of chocolate chip cookie dough and something else. She passed on both Blue Moon and Superman…she was bummed when she saw they had Superman but was happy with what she ordered anyway. J did a waffle cone and picked a special flavor they were advertising on the signs out front. Her pick was Sea Salt Caramel because that flavor combination is amazing no matter what the delivery venue is. 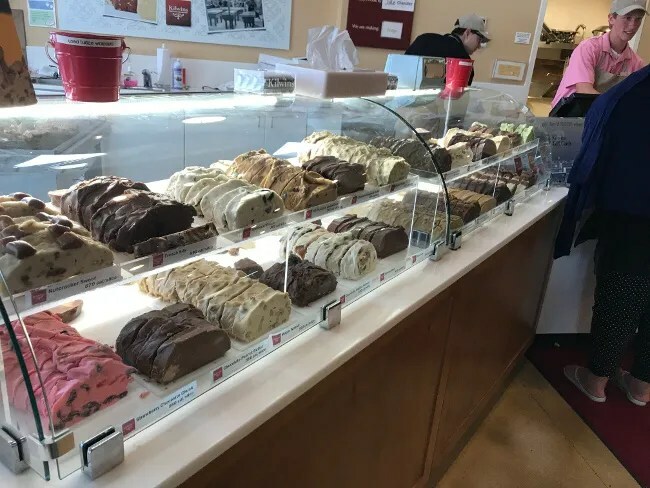 We spent pretty close to $40 on fudge and ice cream at Kilwins Chocolate Kitchen but it’s so expensive because it’s so well made. 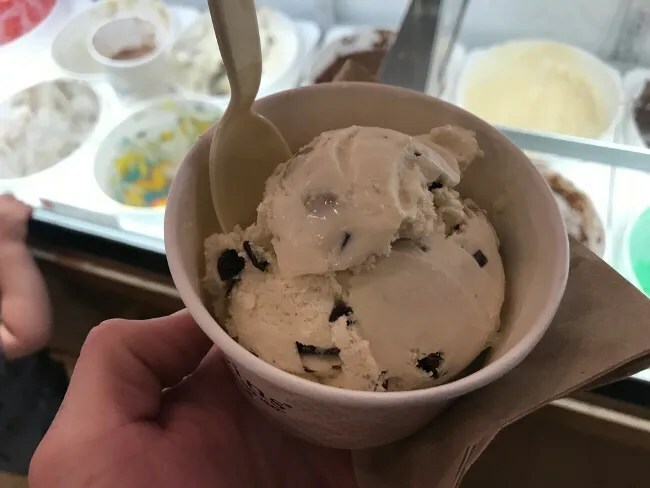 The ice cream is super premium and you can taste the difference in quality. 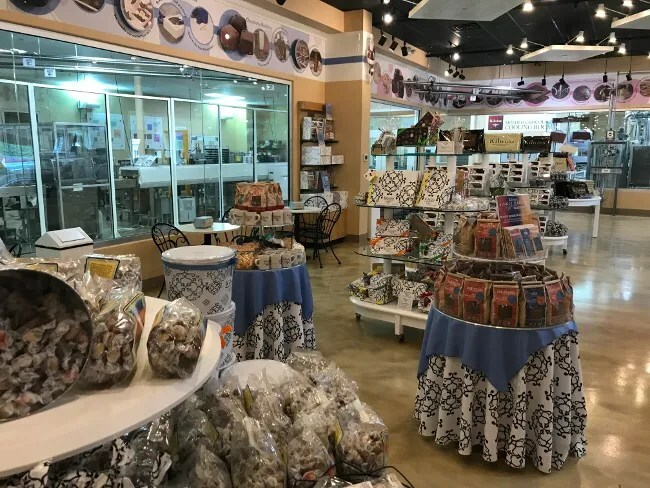 Kilwins Chocolate Kitchen is a unique Kilwins experience you should experience when visiting Petoskey. There are dozens of places around Michigan to get the final product but everything is better when you go directly to the source.